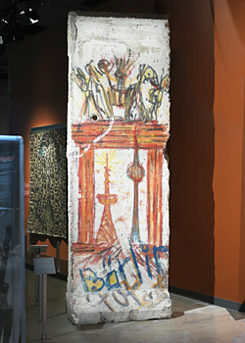 A piece of the Berlin Wall decorated with graffiti was originally on display in the Government Conference Centre in Ottawa. This offering from the German government is meant as a token to commemorate the role this location played in German reunification. When the Wall fell in November 1989, Hans-Dietrich Genscher recognized the urgent necessity for a treaty guaranteeing both German states full sovereignty from the powers that had divided up Germany after World War II. Genscher, who was known as a cunning strategist, wanted to take the opportunity to get all the players together at the table at the Open Skies Conference at Ottawa’s Conference Centre in February 1990. He held exploratory discussions with the Four Powers, in which he urged that the two German states be treated as equal negotiating parties. The withdrawal of military troops was a particularly important point of negotiation between the two superpowers, the United States of America and the Union of Soviet Socialist Republics (USSR). Canadian War Museum in Ottawa | © War Museum On a bitterly cold February day, the West German Foreign Minister Hans-Dietrich Genscher met for breakfast in the German Embassy in Ottawa with his official colleagues: James Baker (USA), Roland Dumas (FR), Douglas Hurt (UK), and Markus Meckel (GDR). While the foreign ministers of NATO as well as Warsaw Pact countries were occupied with establishing bilateral air surveillance, a secret gathering was taking place, resembling one coming from spy novels. The foreign ministers of the Four Powers and the two German foreign ministers hurried from one secret meeting to another. The meetings were all meticulously coordinated by James Baker's secretary. She not only knew how to reach her boss at any time, but was also kept informed about the respective whereabouts of the other parties by their embassies. At a breakfast held by the German Ambassador in the Embassy on February 13th, a draft of the Two Plus Four Agreement was worked out, which still needed to be discussed with the absent Soviet Foreign Minister. Immediately after the breakfast, James Baker drove to the Conference Centre, where the ministers were all taking their places at the oval meeting table. With the help of Eduard Shevardnadze's translator, James Baker intercepted the Soviet Foreign Minister and told him about the contents of the handwritten treaty. On the same day, the Soviet head of state Mikhail Gorbachev approved the contract, surprisingly agreeing to a level of military force in Europe that would be to the benefit of the USA. At the Conference Centre in Ottawa, Shevardnadze, Baker, Dumas, Hurt, Genscher, and Meckel (who is easily recognizable in photos with his dark beard) gathered for a photo without giving a reason. When the Foreign Ministers from the Netherlands, Italy, and Belgium later found out through the media what had played out in Ottawa behind their backs, they questioned the legitimacy of the treaty and demanded a say. After all, there had never been a peace treaty after the unconditional surrender of Germany. However, the Four Powers insisted on the legality of the Two Plus Four Agreement, as they alone had power of control over Germany according to the Potsdam Agreement. At the beginning of August 1990, Saddam Hussein’s troops seized Kuwait, and German Reunification lost its international political importance to the Four Powers, who were involved in the war in Iraq. If Hans-Dietrich Genscher hadn’t acted so quickly, and if he hadn’t used the opportunity to bring the Four Powers together to the (breakfast) table, who knows how long it could have taken before Germany was reunified? Since 2009, the piece of the Berlin Wall can be seen in the Canadian War Museum in Ottawa, where it commemorates the Two Plus Four Agreement negotiated in Ottawa in 1990.